Drought is one of the natural disasters that can be reverted by nature itself. Even though it is a natural disaster, it is one that can be prevented by man up to a certain extent. In this article, we will see what drought is, its types, causes and effects. Drought is a temporary situation in which there is the rainfall is below normal that leads to water shortage. Even though it doesn’t affect much initially, it has serious consequences. The precipitation becomes low which affects the ground and surface water. The entire area dries up and cracks are formed on the ground. This situation can last for months and sometimes even years. It comes under the category of natural disaster owing to changes in climate and global warming. Agricultural drought : this is type of drought in which the moisture level in the atmosphere minimizes which in turn affects the soil moisture. This in turn affects the agricultural productivity. The produce becomes considerably low which widens the gap between demand and supply of food. Meteorological drought : This occurs due to the change in weather patterns due to drastic changes. The humidity increases, the rainfall becomes low, the temperature rises, water shortage and dry winds are the common characteristics of meteorological drought. Hydrological drought : this is a type of drought in which there is considerable decrease in the level of water in lakes, ponds and rivers due to less rainfall and increase in temperature. Prolonged metrological drought can lead to hydrological drought. 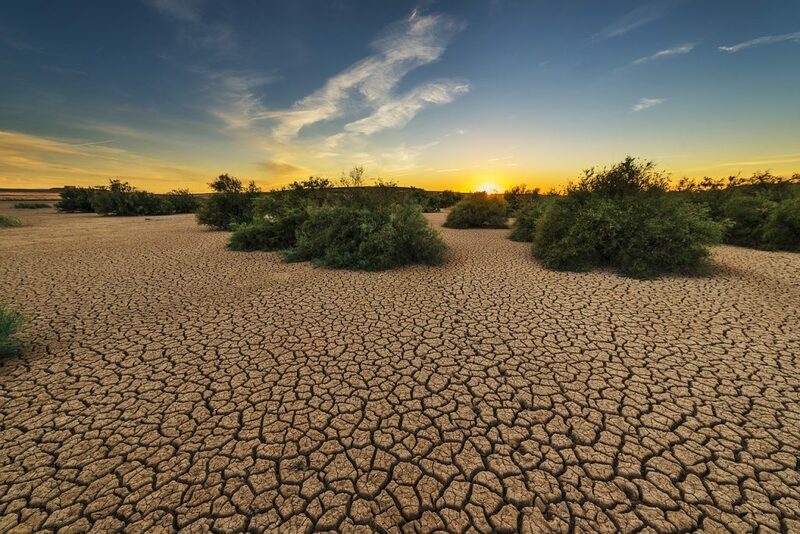 Socioeconomic drought : This occurs due to the gap between the demand and supply of goods and commodities increases owing to shift in meteorological and hydrological drought. This can also happen due to increase in population and decrease in the amount of rainfall. Low rainfall : the main reason for drought is low or lack of rainfall. If a region or area goes for a long period of time without much rainfall, water deficiency occurs in that area. So thus this area comes under the category of drought. Global warming : due to excessive emission of green house gases, the composition of the atmosphere changes leading to the increase in temperature thus causing global warming. The temperature rise leads dry spells and wildfires. Thus global warming adds up to drought. Human causes : humans play a major role in maintaining water table. Human activities like construction, urbanization and deforestation has had negative impact on the environment and climate. There is considerable decrease in the level of water table owing to excessive evaporation due to heat. Cutting down of trees for roadways, airways and construction of buildings have considerably reduced the water holding capacity of the soil. Overall the soil loses its credibility resulting in dry spells. The surface water flow dries easily : due the excessive irrigation and construction of hydro electric dams, the water that flows in the downstream reduces. Rivers, lakes and streams are the main source of downstream. Due to these human activities, the surface water may even evaporate leading to drought. Desertification : this is a situation in which the soil becomes incapable due to its infertility and becomes bare land. Over grazing can also lead to desertification. Apart from all these, severe drought can also lead to desertification of the land and it becomes unsuitable for any vegetation. The possibility of survival of any vegetation is impossible. Water bodies dry up : because of drought, the water bodies like lake, rivers, ponds and streams dries up quickly. The natural habitat gets disturbed. The wildlife, aquatic life, forests and all gets endangered due to this process. The entire ecosystem and the natural life cycle get disrupted. Reduction in crop yields : during drought, the agricultural yields reduce considerably. This increases the gap between the demand and supply of crops. The farmers have to incur a huge loss i.e. pay more for the labor with fewer outcomes in yields. Migration and death of animals : due to drought in an areas, the animals are forced to leave their habitat and move to new areas where there is water and food. As far as animals are concerned, it is very difficult for them to adjust to newer environment. It can also lead to the death of many animals because of the loss in natural biodiversity. Monetary loss : the monetary loss incurred during a drought is very high. The loss is incurred by businesses, families, government and even individuals at lower levels. Waterborne diseases spread : the quality of the water decreases due to water scarcity. The available clean water will not be sufficient for drinking and cooking purposes. Chemicals and impurities mixed with the water will be widely used owing to the spread of waterborne diseases like cholera and typhoid. Migration of people : people are force to migrate to better conditions at the time of drought. This mainly affects the livelihood of the poor farmers who wholly depend upon their agriculture for a living. Because of the loss incurred, the family has to undergo through a lot of stress and strain which leads them to do other jobs. Elderly people, children and women are the most affected during a drought. Malnutrition and deaths : many people die during drought because of hunger and malnutrition. The major reason behind this is the non availability of food. Such situations are usually seen in poorer countries. Hydroelectric power becomes expensive : because of the dry spells and lowered water levels in dams and rivers that were used to generate hydro electricity, more energy should be utilized for the same. So the power generated at a cheaper rate has to be given t a higher rate due to shortage of water. Due to the huge loss in incurred by the energy industries that utilize hydroelectric power. Drought is a natural disaster due to manmade causes that has to be dealt with globally. Proper measures should be implemented by the government to check misuse of water available. The water resources should be properly used without wastage. More and more trees should be planted so as to maintain the credibility of the soil. Planting of trees is very important to maintain the water table beneath. The emission of green house gases should be banned so as to reduce global warming and drastic change in climate. Rain water should be harvested in each and every household so that water can be used for summer seasons. Drip irrigation should be practiced in farming so that very less amount is wasted in the agricultural lands. Waste can be effectively managed so that it can be reused for many other useful purposes. The soil moisture should be checked regularly so that early sighs of drought gets indicated. Awareness programs should be conducted regularly so that people will be aware of the importance of water. If all these are followed, water scarcity can be tackled to a great extent. This can build up healthier generations.